The tide made up very fast, and soon we weighed and started for Havengore over the sands, but the sight of a horse and cart crossing the entrance of the creek shewed us that we were too soon to get in; we therefore brought up again, and by-and-bye one of the light barges made a start and stood in under foresail and topsail. We weighed anchor, having about four feet of water, where we were on the flat to windward of the creek, and bearing up we ran down to the beacons, sounding as we went with the boat-hook, ready to run her off if the water shoaled too much, and standing by to flatten in the sheets as soon as the water deepened, and we reached the creek. The old barge had got into the channel between the beacons all right, but having little way on, and no mainsail set, she was all the time sagging to leeward, and at last she stuck fast on the lee side of the channel, just on the point of the bend. 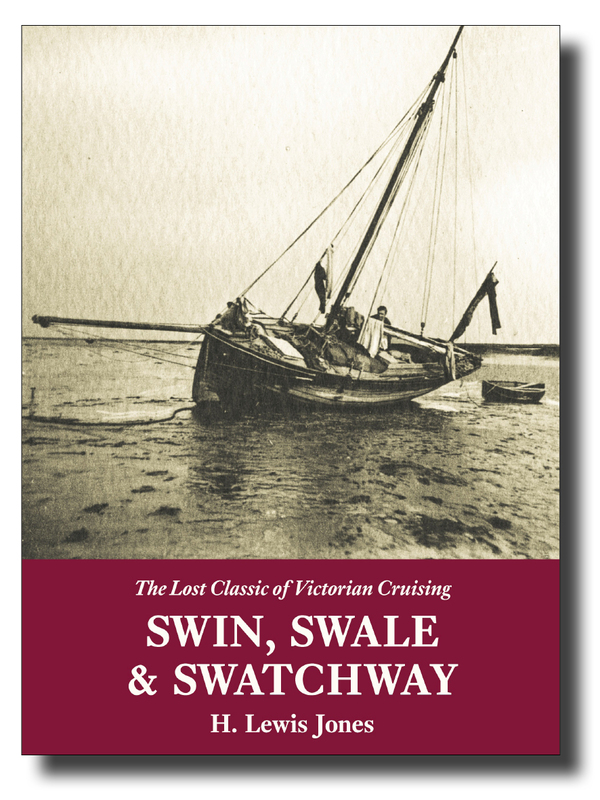 Published in 1892 in a small and now scarce edition, Swin, Swale & Swatchway pre-dates and inspires both Maurice Griffiths and Francis B. Cooke in giving us the sailor’s experience of London’s doorstep wilderness, the Thames Estuary, and the boats and characters inhabiting it in late Victorian times. These charming adventures and human encounters have an engaging immediacy about them, and are enhanced by the author’s many photographs, which have weathered the years well to provide a priceless glimpse of a perhaps familiar territory, but in a time long gone from us. Our small hardcover edition of 2011 sold out rapidly, and we are now delighted to make this sought-after book available in our affordable, high-quality softcover format. There is a cracking video review by Dylan (Keep Turning Left) Winter, of our original hardcover edition. ISBN 978-1-907206-30-6; 216 x 156mm, 144 pages, mono photos, map. Softcover with sewn binding, cover flaps and matt lamination.